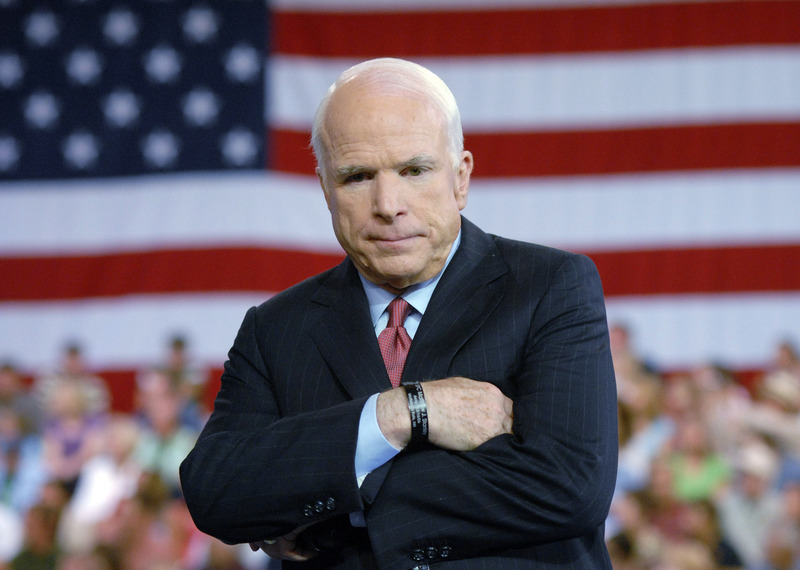 As the news traveled quickly about Senator John McCain's brain tumor diagnosis, CBS News chief medical correspondent Dr. Jon LaPook joined CBSN's "Red & Blue" to explain what it means for the 80-year-old politician. LaPook said this is "a primary brain tumor" which started in McCain's brain, and that it didn't spread there from somewhere else. The diagnosis follows the senator's procedure on Friday to remove a blood clot from above his left eye. LaPook mentioned that he had been wondering why doctors were waiting for a pathology report before deciding on further treatment for McCain. He adds that the most likely possibility was metastatic melanoma, since McCain had battled that in the past. But it turned out to be a different cancer. "I was quite surprised to find out that it was glioblastoma ... a very serious type of brain tumor," LaPook added. "The problem with glioblastoma is at the time that it is discovered, there are almost always microscopic cells that have spread elsewhere in the brain because it spreads along the nerve cells." Now with the statement out Wednesday night, the senator and his family are reviewing further treatment options. "The next thing to do would be chemotherapy, radiation," LaPook said. "He's in for a battle, this is a very serious kind of cancer and it's the kind of cancer that killed Ted Kennedy. Despite all the research that's been going on, we haven't made adequate progress." What happens if McCain steps down? Some of the symptoms of glioblastoma, according to Dr. LaPook, include headache, general malaise, and visual problems (including double vision). In addition, speech problems are tied to glioblastoma. LaPook said that one possible example that may have been a precursor to the diagnosis occurred during the James Comey hearing last month. McCain faltered for words during the public hearing in front of the Senate Intelligence Committee. LaPook said that McCain's treatment could last four to six weeks and he could possibly return to the Senate depending on how he does, especially for his age. "He's battled melanoma, he's battled being a prisoner of war and now this is his next battle," LaPook said. Meanwhile, LaPook did mention exciting new possibilities for McCain after chemotherapy/radiation treatment. "One of them addresses the fact that cancer tends to hide from the immune system -- it kind of clothes itself in a cloak of invisibility. The idea is to strip away that cloak," LaPook said. "At Duke University they're taking inactive polio virus and they're injecting it directly into the cancer to stimulate the immune system to kill the cancer." LaPook adds that those researchers are having some interesting results. One challenge facing McCain and those with glioblastoma is the so-called "blood-brain barrier," LaPook points out. This difficulty prevents medicine to enter the brain, but there may be hope. "One really interesting approach is to use nanoparticles -- you put the medication inside those -- and you use it to sneak into the brain and then it gets released and hopefully will fight the cancer," LaPook said. For more information on the Duke University polio trial or other brain cancer trials, click here or call the Preston Robert Tisch Brain Tumor Center at Duke 919-684-5301. For more information about the nanoparticle treatment, click here to be taken to the The Lenox Hill Brain Tumor Center website.